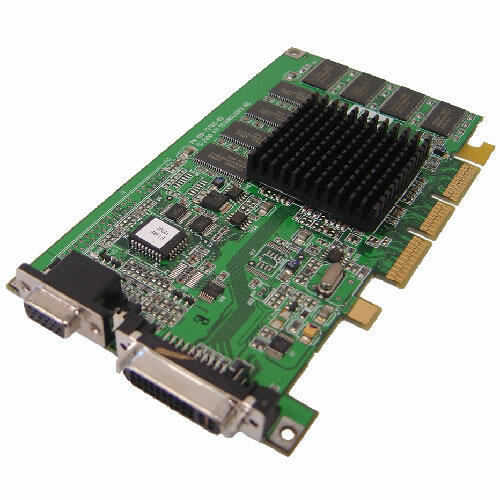 The ATI RAGE PRO 128 is a fully integrated 128-bit graphics and multimedia accelerator that offers leading-edge performance in all three vectors of visual computing: 3D, 2D, and video. Compatible with 1x- 4x AGP it is capable of powering one 23 Inch display at a maximum resolution of 1920x1200. It provides two outputs, an ADC digital output for use with an acrylic Apple Display and a VGA output for use with a CRT monitor. Please note: The image provided shows the card without a faceplate attached but the card comes with the faceplate attached. This video / graphics card is a direct replacement for a dead Apple Power Mac video card. NB. The image above shows the card without a faceplate. This card comes with the faceplate attached..